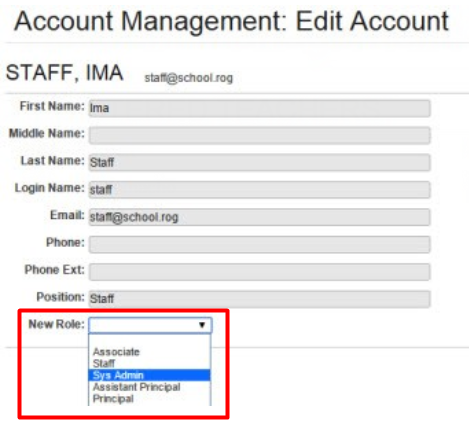 Changing account roles allows you to switch a user's current role to Staff, SysAdmin, Principal or Vice-Principal, without needing to create a new account. This can be used, for instance, if a staff account has moved to a SysAdmin role. Search for a user via User Management. Select the new account type in the New Role drop-down menu. Do not confuse this with the Position text box, which is merely a label and does not affect the type of account the user has. This feature cannot be used to change a non-teacher role to a teacher or vice-versa. If you need to change a user role to or from Teacher, contact School Loop Support so that the role may be changed for you.